The Largest Cap Collection in The World! The largest selection of hats in the world! Have you ever wondered where you could find the biggest,most varied, and most interesting collection of (I guess they go hand in hand) of men and womens Hats? The answer is, drumroll please, Alaska! To be more exact it’s in Tustumena Lodge, Alaska in the former Kasilof’s Bar Cap Collection. The Anchorage Daily News ran a story about the record setting cap collection that at the time numbered 22,014 hats and caps. Yup, we also think that’s a pretty big collection. At the time the bar was owned by John and Suzie Cook. The collection started in 1991 when a friend died and left them with 135 hats which is a lot for most people but it seems wasn’t enough for them. So they hung them on the lodge’s center beam and the collection just kept growing. One of John Cooks favorite hats in his collection was a Chinese pith helmet made of tightly woven grass fibers. Well at MyHeadcoverings.com if you want a chinese pith helmet I’m afraid we can’t help you but if you want a more typical bucket hat, straw hat, or a cloche, well then you’ve come to the right place! Cotton Pre-tied with Height – Great for Chemo! 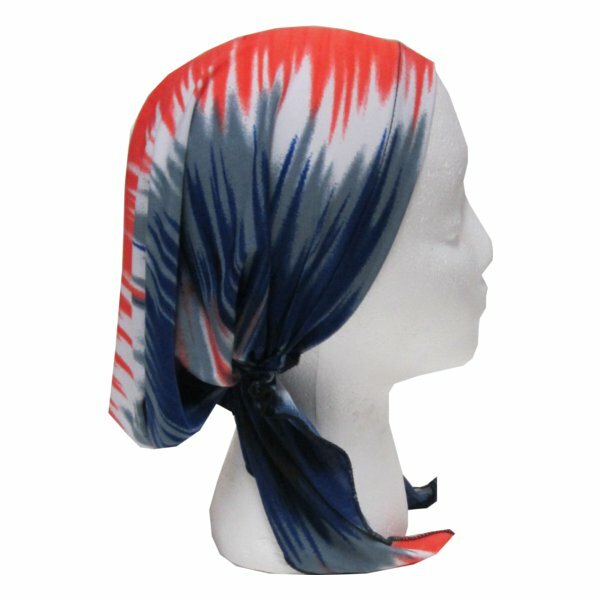 Many women purchase headcoverings to help them deal with hair loss following chemotherepy treatments. Chemotherapy is currently the main tool used to battle cancer. Usually it’s a drug which destroys the cancerous cells in the body. Unfortunately it doesn’t discriminate and therefore it can also destroys “good” cells, thereby damaging the hair follicles making hair loss an inevitable side effect of this treatment. There are a great many options available for women in this situation and each women is encouraged to make sure she finds the one that is best for her and makes her feel most comfortable. However if a woman chooses to use head scarves or headwraps during chemo there are some important things to keep in mind. There are two major problems with scarves, one is “slickness” and the other is itch. Let’s tackle slickness. Scarves made from satin or silk or any material with a slick texture will usually have a difficult time staying in place on one’s head and “slippage” becomes a major problem. Either avoid them completely or use a “wigrip” or cotton undercover – 2 different products that eliminate “slippage”. The next thing to bear in mind is comfort. Many wool fabrics will itch and unnatural polyesters in in many cases are not “breathable” and will cause excessive uncomfort. In light of these facts, it is usually best for women undergoing chemo to purchase headscarves made from natural fibers such as linen or cotton that are “breathable” meaning they allow the scalp to breathe. If the place you are buying your headscarf from does not list the fabric type, don’t hesitate to call them up and inquire before buying. In closing, we hope all who purchase headscarves due to hair loss from chemo only have to use them very temporarily and get their hair and healthy bodies back as quick as possible! Headscarves have tons of different names and one of the most interesting ones is the term Babushka. What is a babushka? Typically, a Babushka is a 3 foot long head scarf that is folded into a triangle and then tied under the chin. How did Babushka’s get their name? Well the term Babushka is really the Russian word used for Grandmother and it is still quite typical for elderly women in Russia to cover ther hair with a headscarf in this manner. However don’t think for a minute that giving head scarves the name Babushka means that headscarves can’t be cool ‘cause not cool “Babushka’s are sooo yesterday. In June of 2011 NPR ran a story of some very very cool Babushkas. A group of elderly Russian women all widowed from the village of Buranovo in the Udmurt Republic formed a band that was pretty good. They became somewhat of a sensation in Russia started giving concerts around the country. Eventually they scored an invite to the Eurovision contest and they showed up on the flashy Eurovision set clad in their taditional Urdmurt clothing, Long dresses, and yup, Babushka headscarves. No they didn’t win that year’s Eurovision contest but they did prove that headscarves – especially Babushka Headscarves – are really cool! Head Scarves and Spring Cleaning! The month of March brings back memories of 3rd grade when my teacher taught us “March comes in like a Lion and leaves like a Lamb.” I find warmth in the cold beginnings of March knowing that spring is just around the corner. And once spring arrives, all I want to do is just get out of the house and revel in the delicious spring weather. But there’s work for me at home, too. Being cooped up all winter has taken its toll on the house. The window need to be washed, the curtains and comforters aired and the dust attacked. Time to roll up my sleeves, turn on the music, get out the cleansers and scrub! So first thing I’ll do is tie up my hair and reach for my favorite head covering. I hate the feeling of sticky hair on my neck, and trust me, we’re gonna be workin up a sweat. My favorite head covering is a pre-tied bandana headscarf made of cotton fabric. It is stretchy, breathable, keeps the hair away from my neck and is a fabulous floral print – just what I feel like wearing in this spring cleaning season! I like to clean with natural ingredients like lemon juice or vinegar. Lemon juice I definitely want to keep outta my hair – I’m just fine with the color, thank you… And vinegar – I don’t even want to think about what would happen if that got in my hair! Plus, when I’m dusting where do you think most of the dust ends up? On me…Thank you pre-tied bandana! Like I mentioned earlier, I do work up a sweat cleaning away on those beautiful first days of spring so I have other replacement head covers to change into when the need arises. There is my comfy cotton beret, cotton paisley headscarves and other assorted hats and caps I’ve picked up over the years. So this spring when you reach for the cleansers, take my advice and reach for a head scarf as well! Should I Tip the Waiter?…My Head Covering Fiasco! Well, it all started out on a beautiful sunny Wednesday when my mother in law called and asked if it would be okay if she could come by Sunday night for supper to come visit the kids. What was I supposed to say?!?!? No???? Of course I had to tell her to PLEASE come that we would be soooooooooooo happy to see her. From that second on the sun was not shining outside any longer. I went from begging the cleaning lady to come on Sunday from 7 am – 7 pm for there was NO WAY my mother In law was walking into such a disaster and of course making my manicure, pedicure, facial and hair appointment. Then shopping for clothing for the kids, myself and my husband and starting to cook. I had not a second to breathe. Sunday night came before I knew it. I must say, the house looked tip top and the kids looked adorable. 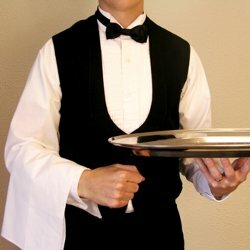 The waiter was ready in the kitchen and of course I looked like a dream. The evening started off better than I expected- that’s until the waiter came out proudly holding my fresh ambrosia for the entrée and accidently bumped his toe into the leg of my chair dropping one right on my head. Just my luck. I excused myself from the table and ran up to my room frazzeled. OH NO!! What to do?? Luckily it had only touched the bottom ends of my hair so I just wet the ends a little and brushed it out. There was no way however that I was going to walk down with half a blow dried head so I quickly grabbed my new banana clip and gently clipped it on. Wow. That did the trick! It looked freshly blown with that extra wave and volume. Luckily my mother in law loved the banana clip and I started to feel like it was a good thing that embrozia fell on my head – since when do I get a compliment from my mother in law?!?! Anyways, I proudly got up to go to the kitchen to get the next course when I passed the mirror and realized that I had some ambrosia on the top of my head too that I hadn’t noticed before. Gosh – how did I miss it?!? I ran back up to my room in a dash and grabbed the new beret my grandmother had got me as a gift and put it on my head. Okay, I must say it did look a little silly together with the banana clip but it did the trick. I came back down and headed straight to the kitchen to get the next course and proudly walked into the dining room. This time my mother in law obviously didn’t think I looked that great. “Honey” she said “what got into you?!?”. “Well” I said “I really am kinda chilly”. I could see she wasn’t quite pleased with the answer, I mean, It was summer after all….. “Next thing you’ll tell me is that your becoming religious and covering your hair totally with a headscarf!”. I just laughed but deep down I was thinkin boy is that a great idea for next time….